St Clair resident Andrew Fender was only two minutes from home when a motorcyclist came off his bike and collided with his brand new car. As a registered nurse he was able to provide first aid to ensure this young motorcyclist received instant care. Now Mr Fender is fighting to see Mamre Road upgraded and is urging the community to sign the petition. “Over the past year I have witnessed first-hand the devastating accidents that have taken place on Mamre Road. I cared for victims from a horrendous fatal accident which occurred last year,” Mr Fender said. “Last month I was two minutes away from my St Clair home when a motorcyclist came off his bike and hit my car on the corner of Mamre Road and McIntyre Avenue. Every day residents of St Clair and Erskine Park must contend with the increasingly unsafe Mamre Road, battling semi-trailers, congestion and risky decisions of impatient motorists. 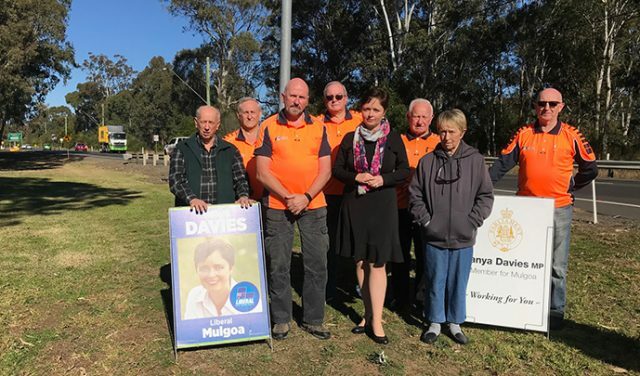 Numerous concerned St Clair community members, including the St Clair Men’s Shed, today joined Member for Mulgoa Tanya Davies to call on the Federal Government to support the upgrade of Mamre Road. “For too long St Clair and Erskine Park residents have battled to turn onto Mamre Road often making risky decisions with grave consequences,” Ms Davies said. “Last year alone there were nine casualty crashes, five serious injury crashes and one fatal crash which resulted in the death of two people, left 21 people injured and 12 seriously injured. “Every day Mamre Road is not upgraded more lives are at risk. Mamre Road is a key transport corridor which passes through the Western Sydney Employment Area and the Western Sydney Priority Growth as well as providing access to the M4 northbound and southbound for St Clair and Erskine Park residents. “With the new Western Sydney airport the traffic with only get worse and the pressure placed on the already dangerous Mamre Road will only increase. “Last night I launched the petition for the upgrade of Mamre Road and overnight we’ve had an overwhelming response. Already 200 have signed the petition. The proposed upgrade will provide a four lane divided road from the M4 to Elizabeth Drive. This will include two lanes northbound and southbound, upgraded intersections, a shared footpath, and a wide central median to reduce head-on collisions. The NSW Government has already committed over $2 million to plan the upgrade of Mamre Road, which is currently estimated at half-a-billion dollar project. Principal of Mamre Anglican College, Cathie Graydon is concerned for the families and staff who use Mamre Road to get to school each day. “There is an urgent need for Mamre Road to be upgraded. The increased commercial development along Mamre Road has meant a significant increase in heavy vehicle traffic along a single lane thoroughfare,” Ms Graydon said.